Lines do exist underwater however, even if they are only suggested by linking several unrelated objects in a scene. We have already covered the most common line, the 'horizon'. Other lines are harder to identify: the line of a diver's body, the shadows your flashgun will cast, rays of light in a sunburstOptical phenomenon of distinct light rays observed underwater whilst looking up at the surface when the sun is out. A calm surface accentuates this effect.. Lines are present with all subjects, although you may not have a conscious awareness of them until you analyze your results later. When you do find lines, they will feel stable when parallel to the sides of the frame, and appear more dynamic when placed as diagonals. The one obvious place that straight lines do occur underwater is on wrecks, and for this reason it is often more profitable to look along wrecks, not just straight at them. When using lines, remember that diagonals and corners of the frame are best if they don't meet exactly. Running a diagonal into a corner looks too contrived, whereas, a near miss looks spontaneous. This is a good ploy to introduce a little movement, especially when you link the center to a corner. If you take a line and add two more diagonals you have a triangle; this is also a dynamic shape, as are all converging diagonals. All photographs are two-dimensional representations of a three dimensional scene, and so it is important that we do everything in our power to re-introduce a sense of depth and give our subject prominence. Otherwise, subjects at different distances may appear to be at the same point. We have a variety of 'weapons' in our arsenal to emphasize the particular qualities we think will make our image work: viewpoint, lighting, pattern, texture, perspectiveAttribute of lens focal length that determines the apparent relationship between foreground and background i.e. compresses or exaggerates it, and framing. One important solution to the problem of adding depth to your pictures is lead-in lines. Lead lines are just what they sound - lines that lead the eye into a scene. Take the example of shooting up a shotline. You have divers descending towards you. Remember that if you place the line dead center it is nowhere near as dynamic as running diagonally into an edge (avoiding going directly into the corner). 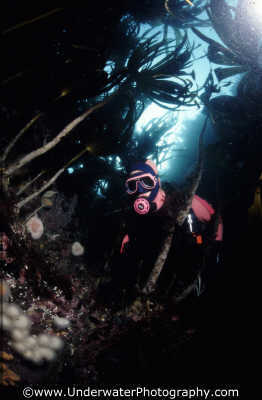 The lack of straight lines underwater to indicate perspective makes it difficult to introduce depth to your pictures. Converging lines, like the edges of a road receding into a distant vanishing point as seen on land, help strengthen the three dimensional illusion. 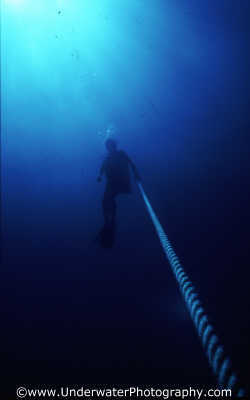 A lead-in line need not be straight; it can be anything - the horizon, the line of a divers arm, anything!